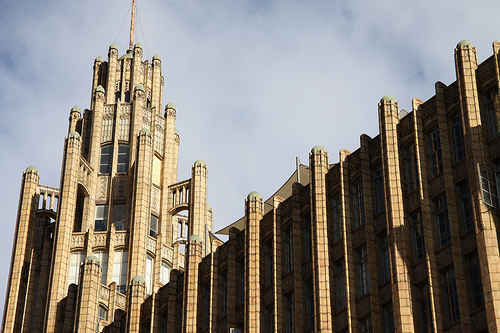 Wandering through the streets of Melbourne, you will come across some beautiful examples of Art Deco. Glorious artwork and sculptures have been lovingly preserved both on the facades of buildings and also in their interiors. 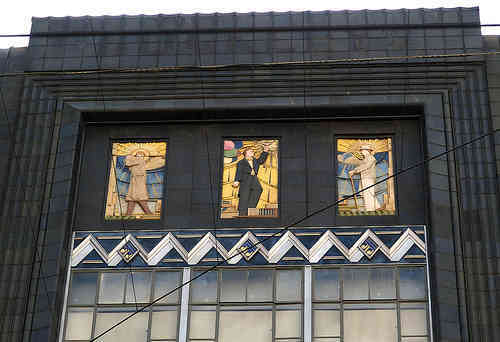 On the 6th floor of the Myer Emporium store in Bourke Street Melbourne, Australia you will find the amazing art deco murals painted by Napier Waller. 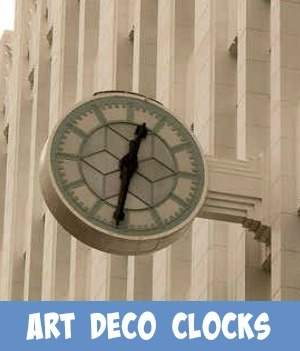 This true art deco style has been artfully preserved and displayed, to truly show the art deco artist's amazing talent. Napier Waller lost his right arm in World War 1! However he managed to learn to paint with his left arm and then proceeded to become Melbourne’s major mural artist. 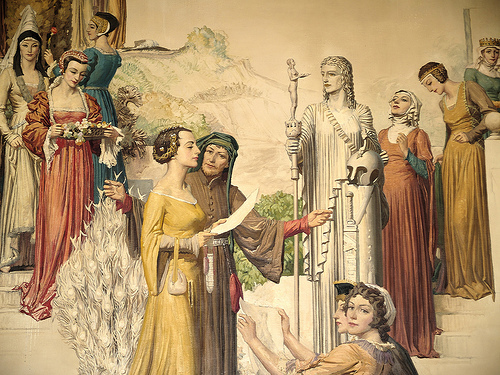 His Myer murals depict women in all manner of fields. 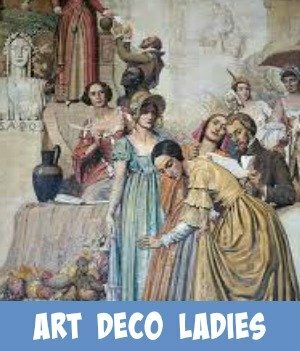 For instance, women’s fashion throughout history. This includes the art deco fashion era. These artworks have been artfully displayed on the Myer Mural walls, along with sea and land transport vehicles found throughout history. 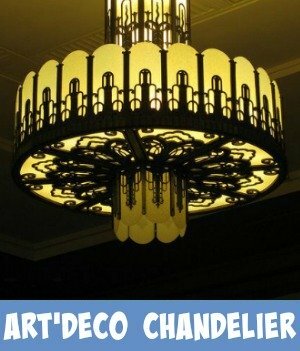 Click onto the map to enlarge it and follow the directions to that specific art deco wall art. 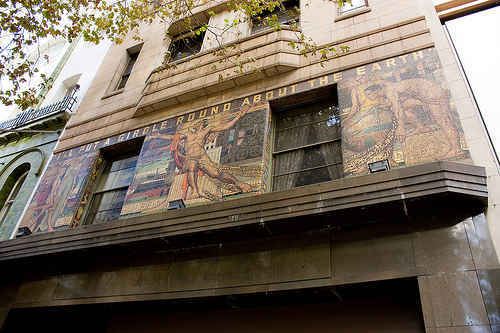 Napier Waller's work is also featured on the outside of Melbourne's Newspaper House. 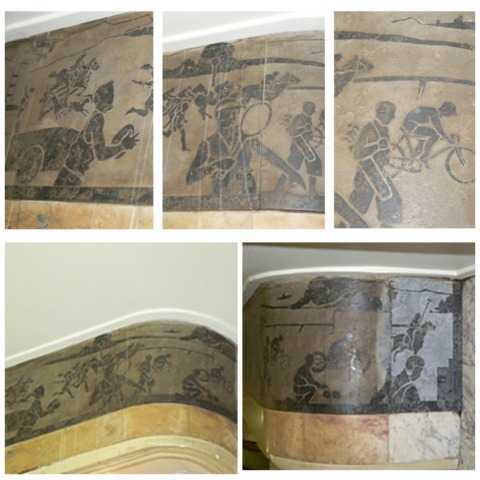 Technological advancements and the modernistic influences are captured in mosaic. The statement "I'll put a girdle round about the earth", exemplifies the ever shrinking world due to transport innovations and newspaper and communication advancements. The Manchester Unity Building has to be one of the most incredible examples of the art deco style, with its art deco interior designs still beautifully preserved. 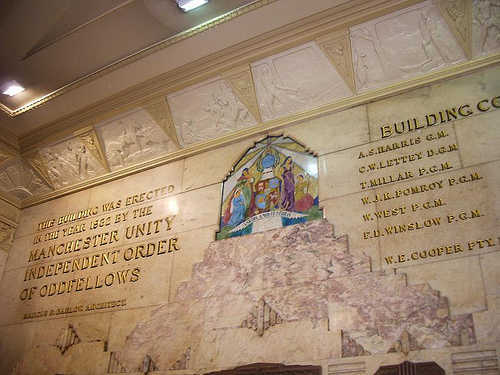 Designed by architect Marcus Barlow and built for the Manchester Unity Independent Order of Oddfellows, the Manchester Unity Building was completed in 1932. It was built at the height of the great depression and provided work for over 300 people. Built in less than one year, the building stands on the prominent Swanston and Collins Street corner. It remains one of the city's most impressive examples of art deco architecture. Australian marbles are used extensively on interior walls throughout the building. The Manchester Unity building is also home to a number of long established dental practices. This includes Collins Dental Image on level 2, and the Manchester Unity Dental Centre on level 4. The building is also home to a large number of Melbourne's jewellery traders. 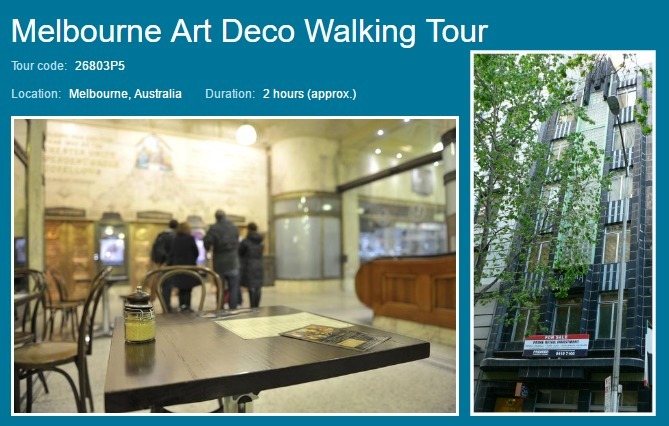 The ground floor lobby, ceilings and cornices artworks depict Aboriginals, Australian Flora and fauna as well as transport, building and primary industries. Come, take a tour through the Manchester Unity Building. When it comes to Art Deco design, this video will show you how magnificent this building is and how well the Art Deco architecture has been preserved. The eastern building facade of the former Buckley and Nunn menswear store, at 298-304 Bourke Street, was designed by the local architects Bates, Smart & McCutcheon. The "Moderne or art-deco-style" building was constructed in 1933-1934. 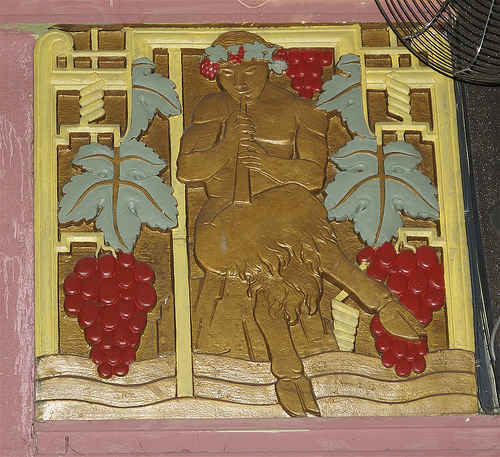 It was decorated with male bas-relief figures in jazz-age costume, glazed terracotta panels and spandrels faced with stainless-steel chevrons and colourful musical-note symbols. Buckley and Nunn was taken over by David Jones in 1982. The Astor Theatre is a classic, single-screen movie theater located in St Kilda. The design of the theatre is in the Art Deco style typical of the time. The Astor Theatre is also listed on the Victorian Heritage Register. It also maintains the tradition of showing Double Feature screenings for the price of single films. Enjoy a step back in time with this video depicting some of the theatre's amazing art deco style. November 1924 saw the opening of the new Capitol Theatre at 113 Swanston Street, in the heart of the city, opposite the Melbourne Town Hall. The reason that this theatre has been included here, is that in this building, is an enormous Art Deco geometric plaster ceiling that flows down onto the theatre's walls. Thousands of coloured lamps produce light that changes through all the various pastel hues of the spectrum, these are hidden amongst the plaster panels creating a crystaline cave effect. 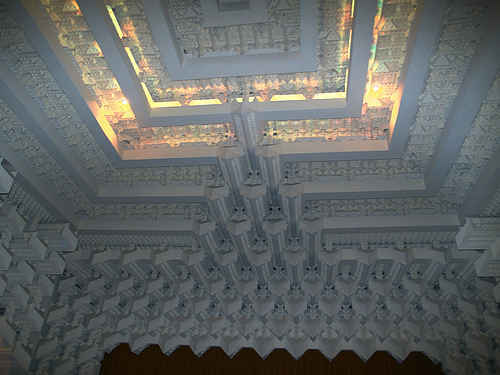 Truly a beautiful example of Art deco wall art, even if it is on the ceiling.